The 6:30 AM-to- PM part of the day at the high school was interesting. I arrive at 6:30 AM for the final preparations of the day. 7:25 AM – Homeroom starts and it’s too short to do scheduling justice. Three classes (85 minutes each) had lab activities, which had various issues. The fourth class had a Performance Objective Assessment (POA), a required district assessment. During my conference period I had a parent conference on the phone, then went to the Special Ed. room to work with students. After the last class, I knew 16 students would be retaking a different POA, but little did I know there was still more to come. Most students arrived for the retakes – so getting them started is the priority. Another student wanted to discuss grades. She saw the time wasn’t right and was willing to talk some other time – I was thankful. A second student graciously waited as we had to shift from one make-up item to another, and then I finally started 20 minutes of tutoring. It’s 3:00 PM. As the tutored student left, a Special Ed student entered to retake a POA. I decided to test him orally; and I determined he was deficient. Learning is very difficult for him and I would like to continue oral evaluations with him. I tried remediation and found some helpful websites for him to do in the classroom for about fifteen minutes while I continued multi-tasking. It’s 3:15 PM. Another struggling student appears – the one who appeared earlier then left. She was very patient with the hectic after-school period. I’m sure school isn’t easy for her, but her academic laziness compounds the problem. It’s 3:25 PM. A parent appears at the door for a surprise meeting. I excused myself from the student to meet with the parent. I addressed her questions, and she kept it short because she saw I was working with a student. It’s 4:30 PM. The tutoring session is over; and I think it went well. I’m alone in the room, so I prepare to finish a few tasks before leaving for home. It’s 4:35 PM. A student who made-up a POA earlier (and the son of the walk-up parent) wanted to go over the POA to see how he did. Good news – he did well. He’s been improving yet doesn’t yet “show” the grades to please his parents. We talked as I tried to give him some insight in school success. It’s 4:45 PM. Has the last student finally gone? I think so … but it’s time to check the phone messages to see who called. I imagine some parents because it is “Interim Reports Day.” Yep … two parents. I returned the first message as it seemed to be more pressing. Fortunately, it was a positive conversation. It’s 4:55 PM – Time to check my email. Yikes! – an unpleasant note from Special Ed. Good timing! … and to think that working with them and their students has been a source of personal pride on all counts. I’ve even received commendations for that work. It’s 5:00 PM. I’m tired … time to go home – but I have to stop at the grocery store for a few items. I recorded the after-school events. It’s almost 8:00 PM (but I’m home). I had dinner and did the dishes. I haven’t read the paper nor watch the news. Fortunately through dinner, I did get a chance to talk to my wife. I still have those 16 papers to grade so those student can get their updates tomorrow in order to cushion the mid-term report damage. Who knows how many other papers are overdue. Plus, I wonder what I will be doing in class tomorrow – and classroom readiness is another personal pride. I don’t feel ready … all along I keep thinking about the Kroger clerk’s suggestion. This account was a real day – maybe not a typical day – but very real – actually a modified account of a reflection that I wrote (and kept) as one of the assignments required by our building administration. Teacher is a difficult but rewarding career. It’s the joys of movies as October Sky and Mr. Holland’s Opus. It’s the wide-range of emotions from Dead Poets Society and Stand & Deliver. Teaching is also similar to a Rocky movie of being resilient from being a punching bag and getting knocked day. Yes – this was 18 years ago – and to think the pressure on teachers today is much greater than then. I wonder – How many teachers today will reach full retirement? I’ve heard that statement many times from people outside of the profession – along with this one: Those who can, do – those who can’t, teach. Everybody is an educational expert – after all, everyone has sat in a classroom. Yep – everyone who has owned a car is also a qualified mechanic. Everyone who has eaten at a restaurant is qualified to run one. Because I’ve owned GE appliances, I’m qualified to be on the GE Board of Directors. Oh, yes!!! As a group, teachers are very defensive of themselves and their professional. Then again, unless you’ve done it or are/have been married to a teacher, people are clueless about the time, demands, and effort involved – let alone the knowledge behind instruction and the subject matter. But back to my initial statement – Anyone can teach. President Reagan’s National Commission on Excellence in Education (1983) stated that one way to improve teaching quality was to make it easier for non-teaching professional to enter and lead a classroom.. Although the commission’s report was over 30 years ago and teacher certification and licensing has changed since then, the saying and mindset still exists. A body of knowledge exists with any occupation. Plumbers specialize in plumbing’s body of knowledge. They can get stumped because each plumber doesn’t know everything. The same can be said for all professions and occupations. It’s obvious that Anyone can teach decreases the importance of the body of knowledge associated with teaching and learning. How else can one justify bringing in an outside professional who lacks teaching experience and teacher education training? Because the auto mechanic fixes cars, shouldn’t he/she be able to fix my air conditioner and furnace problem? Interestingly, business has a similar and related mantra inside their own organizations – Anyone can train. For example, management promotes a top salesperson into a training position with hopes of the salesperson’s knowledge and experience will help the rest of the sales staff. After all, Anyone can train. Yet, leadership in the business ignores training’s body of knowledge because what are the odds this new trainer has any knowledge about training, training development, and learning? A body of knowledge associated with effective training is significant – just like teaching. And just as Anyone can teach, Anyone can train is an illusion. To many people, training and teaching is getting up in front of others to disseminate knowledge – also known as the sage on the stage delivering death by PowerPoint. 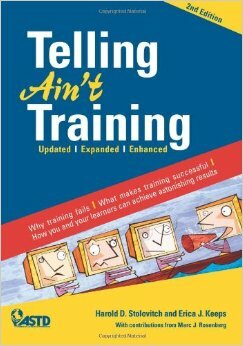 However, like the book title says – Telling Ain’t Training (Harold Stolovitch & Erica J. Keeps) – and telling ain’t teaching either. As a member of a teaching staff, I marched to my own beat as a believer in need for reform across many aspects of education. In discussions, I was often the contrarian in the group. One person described me as, the best devil’s advocate she had ever been around. Of course, I countered her comment that I wasn’t being the devil’s advocate, thus being myself. In the world of educational conformity, I was often the voice in the wilderness. I spoke my mind, and a few of my past colleagues who read these pages will think – Yep, he said that. Packing to move provides an opportunity to sort, discard, and organize. I kept some of my writings from my teaching days, thus recently gathered some of the quotes, most of which were written between 1987-2001. Some will cheer while others jeer. Some will detect a passion, others will think Oh no, he’s one of those. You may disagree with some, all, or possibly none … and that’s OK – after all, I’ve handled dialogue on sensitive subjects before. But keep in mind, because we may disagree, it doesn’t mean I’m wrong – thus it just means we disagree. Below is a collection of quotes with each standing on its own so I’ve numbered them only for reference. 1) Educational curriculum is trapped in the dogma of traditional segregation and academic topics based on times past. Conceptualized applied learning seeks to prepare students for the workplace and life in a global society. Education must selectively abandon topics for the sake of conceptual, applicable knowledge. 2) Educators hiding behind the “they need it for college” banner is nothing more than an excuse to not change, thus continuing to promote the status quo. 3) Only in education do disciplines remain in isolation of one another, whereas in life whereas subjects are integrated. This isolation is like an hour walk in the woods divided into 15 minutes of plants, 15 minutes of animals, 15 minutes of earth materials, and 15 minutes of atmosphere. No wonder students define math (or any given subject) as 3rd Period. 4) Our school’s curriculum needs to be integrated to promote useful information in the world of life; not academia. The educational institution fails to realize that people trained in applicable conceptual frameworks of subject matter and higher order thinking skills will be able to learn the necessary content of the future. 5) Integrated curriculum is an important vehicle for problem-solving, life-based application of content. Life is not divided into specialized time slots as no subject in life is limited to third period. Integration increases student effectiveness and leads to increased use of quality performance-based assessments involving practical situations. Continual use of individual department curricular development support the status quo and the industrial-based educational setting that we proclaim to change. 6) We biology teachers stress the stages of a cell’s live, especially those of cell division (prophase, metaphase, anaphase, telophase). On the other hand, I haven’t heard any of those terms on the evening news or anywhere outside of my classroom other than a conference of biology teachers. Therefore, which is more important: to teach the details of cell division, its phases, and all the parts and activities or to teach the basic essentials of cell division, then followed by focusing on cancer? If given a choice, what would students select? 7) Innovative textbooks/programs exist – the ones that incorporate content standards, teaching standards, assessment standards, and research about teaching and learning. So, why do teachers and school districts avoid them like the plague? In the world of educational conformity, I was often the voice in the wilderness as I spoke my mind, and a few of my past colleagues who read these pages will think – Yep, he said that. 1) If we teach chemistry as if all students are going to be chemists, if we teach mathematics if all students are going to be mathematicians, and if we teach writing if all students are going to be novelists, how many chemists, mathematicians, and novelists have we produced? 2) Assessment practices are locked into measuring low-level knowledge through methods ingrained from our past. 3) Teaching quality is important, yet Dr. Glasser is correct – teaching quality isn’t emphasized today and it should be – and many educators today will deny this. 4) Whereas elementary teachers can learn content and get equipment support from high school teachers, the high school teachers can learn teaching techniques from elementary teachers. 5) All teachers have different skills, strengths, and weaknesses. We hear about the need for lessons being student-centered activities based on research and standards with embedded assessment. Developing those activities is a skill in itself – and how many teachers have those skills – let alone the time? 6) Learning enables people to successfully participate in life, work, and in groups no matter where and when. 7) Learning is more about connections, community, and context than content to meet an academic standard for a test. 8) Learning is an active, social, intellectual, focused, and emotional process. 9) The miracle I would like is restructuring of the school routine to accomplish restructured outcomes for students who want to learn and competently achieve high expectations. 10) Students should be responsible for their own learning, and the information must be understood, applied, and internalized. 11) Few educators at any level think beyond competence. We educators are the ones who have trained the students to do less, do it more poorly, and expect good results. We’ve trained them well at expecting to give little and earn a reward. 12) The grading system has too many carrots and sticks: A, B, C, D, F …. that’s not enough, so add plusses and minuses to each. At best, this is questionable. However, a distinction between competency and competency with highest quality has a place, but, the highest level needs to be for those working at the highest quality and additional competencies beyond the minimum – not the highest level/grade at the minimums – nor a faster/quicker minimum achievement. 13) A student asks, Why do we have to learn this? – I say at least someone in the room has contemplates that question. As a member of a teaching staff, I marched to my own beat as a believer in need for reform across many aspects of education. In discussions, I was often the contrarian in the group. One person described me as, the best devil’s advocate she had ever been around. Of course, I countered her comment that I wasn’t being the devil’s advocate because I was just being myself. Some will cheer while others jeer. Some will detect a passion, others will think, Oh no, he’s one of those. You may disagree with some, all, or possibly none … and that’s OK – after all, I’ve handled dialogue on sensitive subjects before. But keep in mind, because we may disagree, it doesn’t mean I’m wrong – thus it just means we disagree. 1) Listening to the administrators and school boards across this state promote to their public how well their schools are doing causes me to ask this question: If schools are doing so well, why do we need to change? 2) Statements as look how far we’ve come are excuses for the status quo, grand illusions of change, and lack any vision of where to go. When examining where we’ve been, the point of comparison should be where we need to go – not the past. 3) Even if a mindset of reform or even progress toward reform took place in a department, a grade level, or a building staff, would central office let it continue? I’m not so sure because our district’s leaders understand reform, but they don’t believe it. Their beliefs are demonstrated by their actions, and those action don’t demonstrate a restructuring attitude. Too much time whitewashing creates an illusion. They will take credit for success, then painfully point the figure to others when something falls down. Sugar coating numbers only dulls the pain, but cures nothing. 4) Is the educational system too much of a dinosaur to move? (Too much inertia fits.) Probably so. The system is very political, so leaders cannot take risks, and change is way too risky of a proposition. Then again, the lack of leadership coupled with a lack of vision will keep education wollering in the mud of mediocrity while continuing to promote the false illusions of success and change. 5) Central Office leadership tells us that some kids need more time to achieve, and should get it without penalty. On the other hand, building leadership tells us grades need to be completed by a certain time on a certain day. This is an example of what one says doesn’t match with what one does. Therefore, no matter what Central Office says, entering “Incomplete” to give a student more time is not really an alternative. 6) Because I use Crisco oil, I’m just as qualified to lead Crisco production as the public is to run education. 7) Teachers and all level of administrators say students are their top concern. I disagree because students should be the top concern of teachers, while teachers are top concern of building administrators, and building administrators are the top concern of district administrators – thus calling this “semantics” is BS. 8) The public runs education and government. What does the public complain about the most? Education and government. 9) Isn’t good administrator an oxymoron? As a member of a teaching staff, I marched to my own beat as a believer in need for reform across many aspects of education. In discussions, I was often the contrarian in the group. A person described me as, the best devil’s advocate she had ever been around. I countered her comment that I wasn’t being the devil’s advocate, just being myself. In the world of educational conformity, I was the voice in the wilderness. I spoke my mind, and a few of my past colleagues who read these pages will think – Yep, he said that. 1) Change is a journey, not a blueprint. Change is loaded with uncertainty, difficulties, and excitement. Change is hard and it takes a lot of time and energy. In the difficult times of change, three keys are necessary to keep the process moving toward the vision: the presence of a vision, support, and encouragement. Because education reacts to immediate needs, it has a long tradition of short sidedness, education lacks the long-term commitment that is necessary to implement change. So let’s embrace following further behind society. 2) I’m not pro-teacher, not pro-student, not pro-community, and for God’s sake not pro-administrator … but I am pro-outcomes and pro-processes that leads to benefits for the students and society. Thus the mismatch: producing an early 20th century product for a 21st century world. 3) Change is difficult. Some will refuse to travel the journey, yet others will reverse course along the way, which also means some will not survive – yet the strongest, the committed will arrive to establish a new way. 4) The body of knowledge continues to grow, but school processes remain relatively unchanged. 5) Society’s It-Was-Good-Enough-For-Me Club will prevent change from occurring, so pseudo-reform will occur to create an illusion of change rather than change itself. 6) At best, reform has simply been a “tinkering” of the old system; whereas restructuring involves overhauling the existing system to establish a new operating structure. 7) Given the amount of change needed, the educational system would be best served by shutting down for a year to reorganize and retool. 8) Change is more than a determining if we are going to have a Homeroom period or not. After all, the best reason for not having one is to put it back in place down the road.